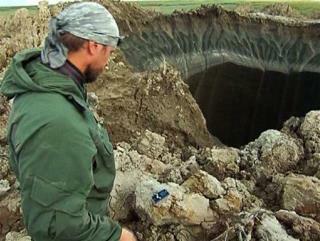 (Newser) – A gaping—and growing—hole in the middle of a Siberian forest isn't the gateway to the underworld, as some frightened locals believe. It may be worse. The Batagaika crater, the biggest megaslump on Earth, may be be a "harbinger" of our warming planet, as Motherboard puts it. The crater, located in one of the planet's coldest places, appeared about 25 years ago, and geologist Julian Murton of the University of Sussex tells the Independent that it was likely born after locals cut down a swath of forest that sat above the permafrost. "Cutting down of vegetation ... removes some of the insulation that keeps the ground cool," he explains, and that allows the summer's heat to reach deeper levels of earth. As exposed ice layers melt, the earth becomes loose and literally slumps. in the last few thousand years the earth has been warmer (and cooler) by a couple of degrees then it is today. the permafrost did not blow up then and kill us all, it might not do so again. what i find curious (and leads me to think something else is going on that the article does not get into) why hasnt the local water table filled this in to make a lake or pond? If the permafrost ("permanent frost") melts, we are doomed. We will literally fry like eggs on hot asphalt. We need a fix fast.